I knew that embarking on this six week journey to change my life would result in drastic food changes, and one of my favorites so far has been my morning smoothies and protein shakes! Whether its a chocolate protein shake, with half a banana and a handful of delicious berries or my lovely daughter in law makes me a tasty smoothie with greek yogurt, kale and pineapple; not only do I feel a boost of energy but I’m full until lunch! 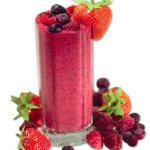 These smoothies are high ORAC (Oxygenated Radical Absorption Capacity) foods, that are “off the charts” in antioxidants. And as antioxidants have incredible energy and anti-aging properties, adding them to your diet will only increase your overall health. 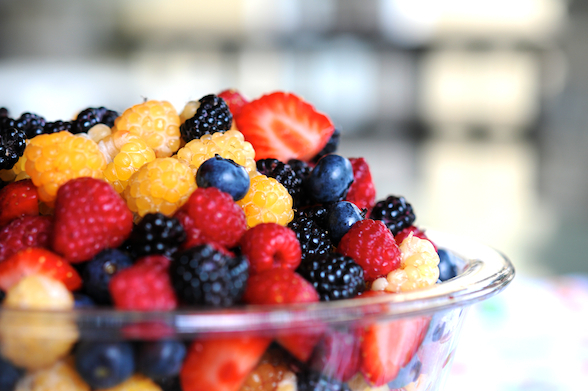 ORAC’s can be found in foods like pomegranate, pineapple, oranges, blueberries, acai berries and green tea. I have known about high ORAC foods for years now, and in working with world class chemists to develop my products, was able to create my Firm & Lift serum + cream with higher ORAC levels than anything on the market. These added antioxidants in my serum + cream improve the texture, smoothness and elasticity of your skin! 1. Foods rich in Omega 3 Fatty Acids— Fatty Fish such as Salmon and Tuna (albacore) are good choices in your diet to help guard against sun damage!! Rich in Omega-3 fatty acids, they protect against sunburn. Other great choices are sardines, mackerel and herring. If for some reason you do not like fish, eat walnuts, flaxseeds, pumpkin seeds, and tofu. 2. Foods rich in Vitamin C—For an extra skin boost, try raspberries, blueberries, blackberries, strawberries and pomegranate– they not only contain vital antioxidants but also Ellagic acid, which has been found to counter the damaging effects of UV rays on the skin. Remember sun damage causes those deep wrinkles. I love prunes but I never want to look like one! 3. Lean Protein—For a period of time I was a vegetarian. However, I feel better when I eat healthy lean fish and meat. In the 101 dermatologist’s study, women who had diets low in protein were more prone to wrinkles. Protein is a vital component of any diet because it is the building block for skin collagen and elasticity. Therefore, may I suggest corn fed beef, range-free chickens, fish, eggs, tofu, and protein shakes as good choices for healthy beautiful hair, skin and nails. I grew up in the mid-west and it is hard for me to get away from a grilled T-Bone steak. I mostly eat chicken and fish, but because I fight anemia and low blood sugar, I cant help but indulge in this form of protein that is deliciously high in iron. #LifeChangeCheckin: How are you doing on your journey? What changes have you made that are working? What’s not working? Let me know on the Leigh Valentine Facebook Page!